Leading malayalam gec mazhavil manorama bringing latest block busters for the easter/vishu celebrations, as per promo ramaleela, shikkari shambu, vikram vedha are the premiers. there may be more films in the list, we can wait for more details. keralatv.in already updated Asianet, Amrita TV’s vishu premiers and newly launched miniscreen.info published surya tv films. World television premier of the malayalam political thriller ramaleela will be the main highlight of mazhavil manorama for vishu 2018. they have bagged the satellite rights of rama leela for record sum, our facebook page updated this info long back. Rama leela one of the biggest profitable ventures in 2017, written by Sachy and directed by debutante Arun Gopy. Tomichan Mulakuppadam under the banner Mulakuppadam Films produced the movie. It’s released on 28 September 2017 and collected more than 60 cr from box office. Director Sugeeth’s latest movie Shikkari Shambhu is listed in mazhavil manorama vishu films list. The film was released on 27 January 2018 and still running in cinema halls. Kunchacko Boban, Vishnu Unnikrishnan, Hareesh Kanaran, Sshivada and Krishna Kumar are in the star cast of shikkari shambu. It’s Produced by S. K. Lawrence under the banner Angel Maria Cinemas. This malayalam comedy movie is Written by Nishad Koya and well received by film lovers. 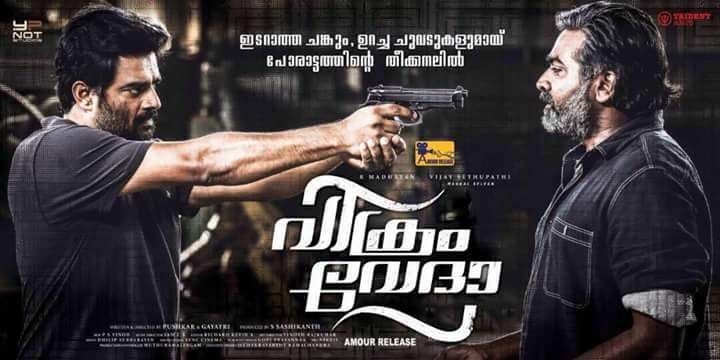 Vikram Vedha malayalam dubbed version can be watch through mazhavil manorama, they holding the rights and decided to premier the same. This action crime thriller film written and directed by Pushkar/Gayathri duo, produced by Y NOT Studios. R. Madhavan, Vijay Sethupathi, Varalaxmi Sarathkumar, Shraddha Srinath, Kathir, Prem are in the star cast of vikram vedha.